This 900-year-old bronze statue of Dancing Shiva, shown on display at the National Gallery of Australia, was stolen from a temple in Tamil Nadu, India shortly before the museum acquired it, new records show. UPDATE 11/6: The NGA has released a statement saying there is no “conclusive evidence” the sculpture was stolen. See below. UPDATE 6/12: Since publishing this post we’ve received documents that show the National Gallery of Art purchased the Dancing Shiva (above) for $5 million, not the $2 million originally stated below and in other media reports. Last July, we wrote that the arrest of Indian antiquities dealer Subhash Kapoor would test the museum world’s commitment to transparency. Federal investigators in the United States have seized more than $100 million in allegedly looted art from the Manhattan dealer, who they describe as “one of the most prolific commodities smugglers in the world.” In previous posts, we have identified suspect Kapoor objects at museums around the world, including the National Gallery of Australia in Canberra, which acquired 21 objects from Kapoor. So far, the NGA has failed the transparency test. As a member of the International Council of Museums, the museum is bound by a code of ethics that requires it to be open about its collection. But museum officials have refused to identify or release collecting histories for the 21 objects. Instead, the NGA created an investigative committee that includes the two museum officials most responsible for the Kapoor acquisitions: museum director Ron Radford (left) and senior curator of Asian art Robyn Maxwell. The museum has promised to cooperate with investigators, but in May, Indian officials complained that the NGA had refused to respond to a formal request for information. (The museum claims it never received the request.) Last week Radford was asked about the case during a hearing of Australia’s senate, but would not divulge additional information, saying only that he was confident none of the Kapoor objects had been looted. Radford’s confidence is sorely misplaced. In the coming days, ChasingAphrodite.com will publish new information about several of the objects the NGA acquired from Kapoor. The records, obtained from sources with knowledge of the on-going investigations, show that several of the objects were illegally removed from Indian temples shortly before Kapoor offered them to Radford, Maxwell and other NGA officials. Many of the objects were accompanied by false provenance papers. Those ownership histories are belied by evidence seized from Kapoor, including photographs sent to him by smugglers soon after the idols had been removed from Indian temples. In 2008, the NGA paid Kapoor $5 million $2 million for a bronze Nataraja, or Dancing Shiva. The more than 4-foot (130 cm.) tall figure depicts the Hindu god as the Lord of Dance, prancing in a ring of flames as he steps on the head of a dwarf who represents ignorance. Shiva is ushering in the destruction of the weary universe so that the god Brahma may restart the process of creation. It is a common theme in Indian mythology, particularly in the Tamil temples of southern India. Kapoor provided the museum with a document stating that he had purchased the bronze from a Washington D.C. man in October 2004. He also signed a warranty prepared by the museum that transferred title to the NGA and indemnified the museum in case of a breach. The story of the Washington owner was a fabrication, the records show. This photo of the Nataraja (left) was sent to Kapoor by smugglers in October 2006. Sources say it was taken soon after the idol was stolen from the Sivan Temple in the village of Sree Puranthan in Tamil Nadu, where it and several other large bronze idols were worshiped before the temple fell into ruin. According to Indian investigators, a year earlier Kapoor had traveled to Tamil Nadu and met with Sanjivi Asokan, the alleged head of a ring of idol thieves in the region. Kapoor asked for Chola-era bronzes, which were in high demand on the art market. Over the next several months, Asokan allegedly hired thieves who — for 700,000 rupees, or about USD$12,000 — broke into the Sivan Temple and stole the eight idols shown below (Shiva at top left.) The idols were allegedly mingled with replicas to convince a government official to certify them as modern handicrafts. They were exported by Ever Star International Services Inc. to New York, where they were received by Kapoor’s company Nimbus Imports Exports in the fall of 2006. For his trouble, Asokan was allegedly paid about USD$200,000. Shiva as the Nataraja, The Lord of the Dance, is the symbol par excellence of South Asian art. It is the full and perfect expression of divine totality—the manifestation of pure, primal rhythmic power. Shiva simultaneously dances the universe into existence by awakening inert matter with the rhythmic pulse of movement, sustains this existence, and sends all form into destruction…. This is the largest, most significant Chola Period sculpture of this subject to appear on the market in a generation. There are many bronze sculptures of Nataraja, and they all share certain basic characteristics. But even to a lay eye, the similarities between the Shiva shown in the smuggler’s photos and the one on display at the NGA are apparent. For example, looking closely at the individual flames surrounding Shiva, most have tails to the left, center and middle of the flame. In both the smugglers and the NGA’s Shiva, however, the first and second flames on the top left and the third flame on the top right have tails to the right and left, but none in the middle. Here is a photo of the Shiva from behind, also sent to Kapoor by the alleged smugglers in 2006. It gives more context for the room, which does not appear to be on Madison Avenue or in Washington D.C.
Kapoor, Asokan and the alleged thieves have all been arrested and are currently being tried in India for the Sivan Temple thefts. Meanwhile, American officials with the Department of Homeland Security’s HSI team have issued an arrest warrant for Kapoor in the U.S. and are pursuing their own investigation of museums that acquired objects from him. We’ll soon post additional documents and photos of Kapoor objects at the NGA and other museums. Meanwhile, institutions that did business with Kapoor would be wise to 1) publicly disclose complete copies of the collecting history for those objects and 2) proactively contact U.S. and Indian investigators. 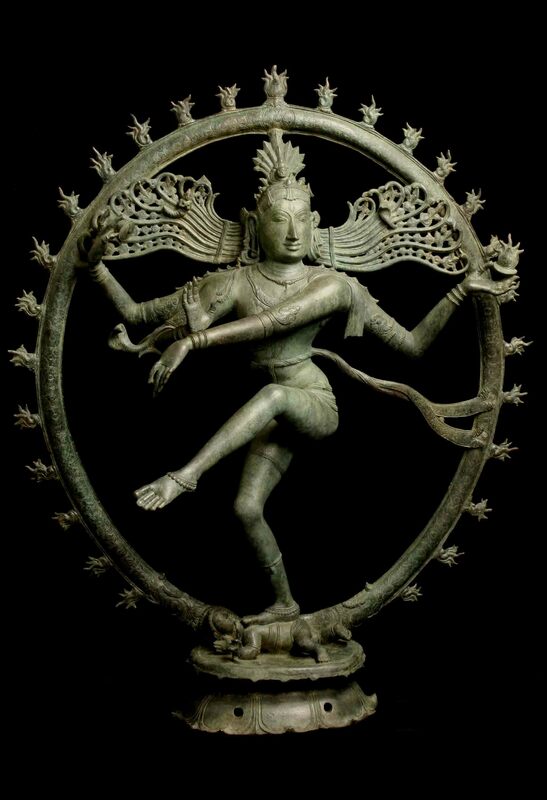 The National Gallery of Australia believes there is yet to emerge any conclusive evidence to demonstrate that the 11th-12th century bronze sculpture of Shiva as Lord of the Dance [Shiva Nataraja] in its collection was stolen or illegally exported from India. The Gallery notes that criminal proceedings against Art of the Past dealer Subhash Kapoor are ongoing. If, at the end of the legal process, the courts determine that this Shiva Nataraja was stolen and illegally exported, the Gallery will have been a victim of fraud. The Indian Government may request the Australian Government to return the work if it is found to have been stolen or illegally exported from India. The court has made no findings in relation to the sculpture. In the meantime, the Gallery will continue to cooperate with the relevant authorities including the Indian High Commission.